Mawlānā Muhammad Hāshim Baghārvī Naqshbandī Mujaddidī qaddas-Allāhu sirrahū was one of the noble deputies of the venerated Sufi saint Khwāja Muhammad ʻUthmān Dāmānī of Mūsā Zaī Sharīf, Dera Ismāʻīl Khān, Pakistan. He was initiated in the Spiritual Path by Khwāja Dāmānī. He kept visiting his shaykh for twenty two years, during which his spiritual journey was completed and he was awarded deputyship. He was righteous, virtuous and a person of poverty. He used to pray that Allah may keep me in poverty during my life, make me die in poverty and raise me in the Hereafter with the poor. He died on Sunday 27 Rajab 1313 AH (12 January 1896), about a year before his shaykh’s death (January 1897). His shaykh Khwāja Dāmānī was very sad on hearing about his death. 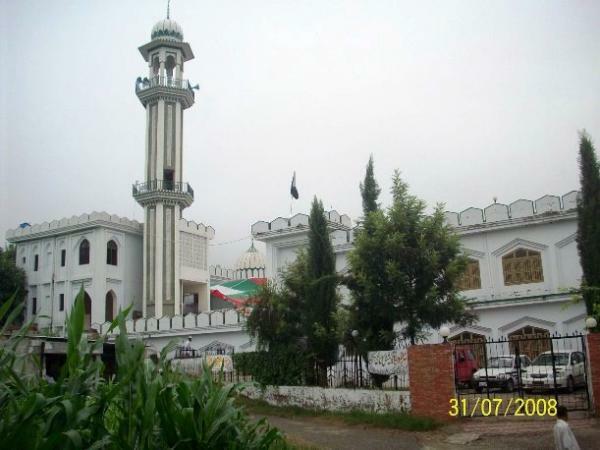 He is buried in the Khānqāh Baghār Sharīf, near Kahūtā, close to the capital of Pakistan Islamabad. His son Mawlānā ʻAbd ar-Rahmān Bagharvī was a student and deputy of Khwāja Muhammad Sirāj ad-Dīn Naqshbandī. He used to prepare and serve tea to the shaykh and other scholars who met everyday between Maghrib and Isha. He died in 1943. Mawlānā ʻAbd ar-Rahmān’s successor was Mawlānā Muhammad Yaʻqūb, born in 1919 at Baghār and died on 7 April 1998. The present manager of the khānqāh and Islamic school is Prof. Sājid ur-Rahmān who is the son of Mawlānā Muhammad Yaʻqūb. This entry was posted in Deputies of Sirajuddin, Pakistan, Punjab, Uncategorized and tagged Baghar Sharif, Musa Zai Sharif. Bookmark the permalink.